(Edit: My review for the 2018 Pureflix movie Samson is here). It is immediately obvious that whilst some of these films include the name Samson in their title, very little of the biblical character is retained except his super-strength. 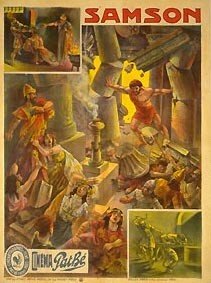 Titles such as Samson vs. the Giant King, Samson and the Seven Miracles of the World and my personal favourites Samson vs. the Vampire Women and the intriguingly titled Samson in the Wax Museum clearly have very little to do with the Book of Judges. There are at least 14 such films out of this 49. But that still leaves an incredible 35 films about Samson. Some of these maybe shorts or cartoons, and some of them may not have anything to do with the biblical Samson, such as Andrzej Wajda's 1961 film Samson which I removed from the list. Even so, with the obvious exception of Jesus, I can think of no other character from the bible who has appeared in more films than this. Who is the youngest Mary of them all?